But Will It All Fit? Gifts play an important role in Japanese culture, so any trip to Japan for us means taking gifts for family and others . . . and in our case this usually means lots of gifts. However, Brett, YaYu and I will only each be taking a carry-on bag, and one additional bag for under-seat stowage (tote bag for me; backpacks for Brett and YaYu), so making sure everything fits and arrives in good condition will be a bit of a challenge. 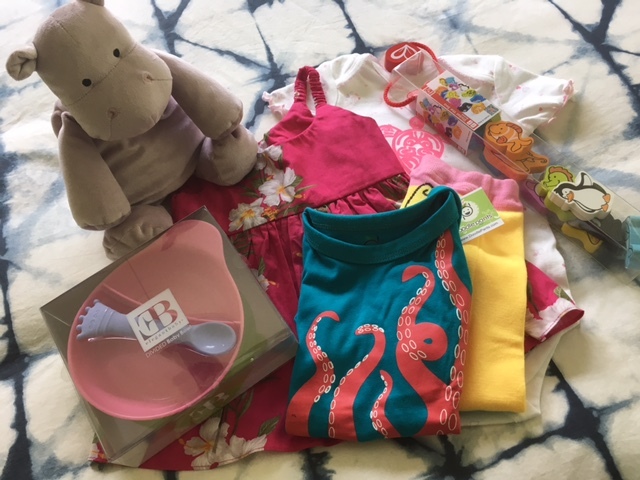 Gifts for our granddaughter: Two onesies, a Hawaiian-print sundress, some leggings, a stuffed hippo, a feeding set, and some ocean-themed blocks. 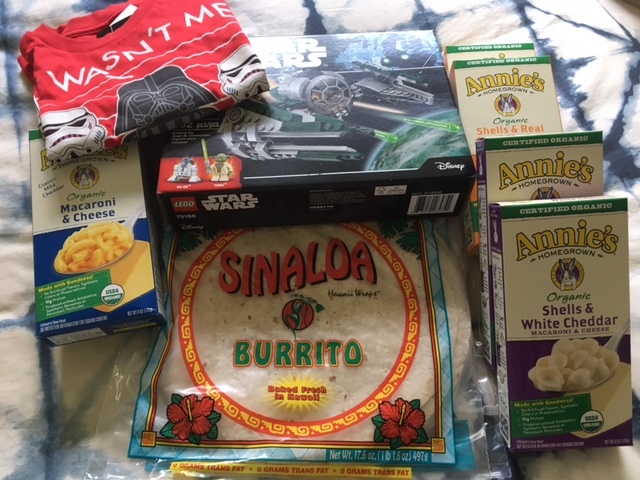 For our grandson: Star Wars Lego set (he’s obsessed with both right now), Star Wars Lego t-shirt, six boxes of macaroni & cheese, and two packages of tortillas (for quesadillas). Tortillas and mac & cheese are available in Japan, but are super expensive. 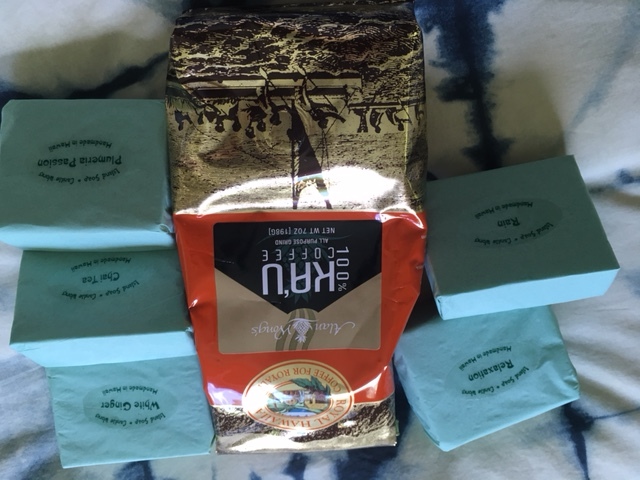 For our daughter-in-law, Kona coffee and Kaua’i made soap. We’re giving our son some of his U.S. favorites that are unavailable in Japan. He especially loves anything chocolate & mint, and it’s hard if not impossible to find in Japan. We’ll also get him two to three cases of Diet Coke from the mini mart in the hotel while we’re there – you can’t buy it otherwise in Japan, and he loves it. 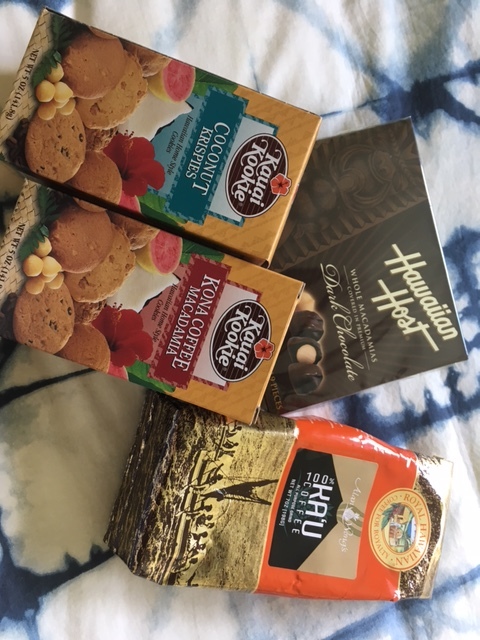 We’ll probably get together with our daughter-in-law’s parents, so we’re prepared with a small gift of Hawaiian items: Kona coffee, chocolate covered macadamia nuts, and Kaua’i-made cookies. 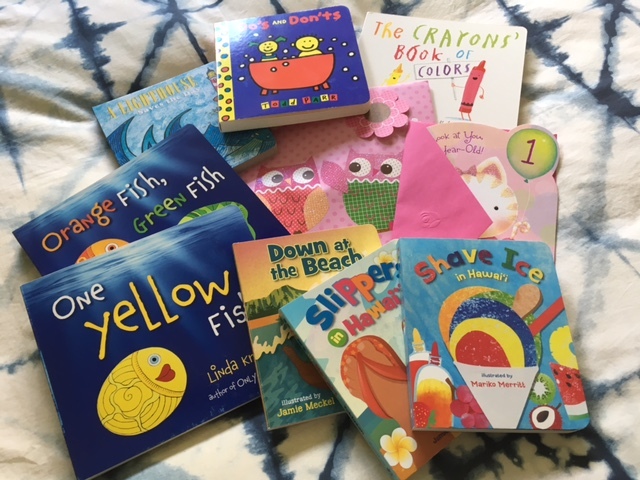 Because it’s so ridiculously expensive now to mail anything to Japan, we are taking along some of our granddaughter’s first birthday gift: eight board books, a birthday card and gift bag. We’ll buy a couple of other things while we’re there for them to put away until her birthday. We’re also taking several gift bags, tissue paper and tape, and will assemble and wrap everything once we get to our hotel room. Presentation is important in Japan! The big question as we start this week is whether we can get all of this to fit into our bags. I think we can – the only “big” items are the box of cereal and the Lego set. Brett is a master packer (and I’m no slouch), and I’m confident will find ways to squeeze everything in. We do have some Space Bags to use if we need them, but I’m hoping they won’t be needed. Great gifts! Yes, you can and it will all fit 🙂 If you have access to a laundry facility where you’ll be in Japan, you can bring less clothes. We pack pretty efficiently, but the New Sanno Hotel has laundry facilities so we’ll be OK. Our son’s condo is a 10-minute walk away so we may walk our dirty laundry up there every other day or so (it’s free). Nice gifts! With three of you squirreling things away, it should work…good luck! Got a smile from your gifts for your son. 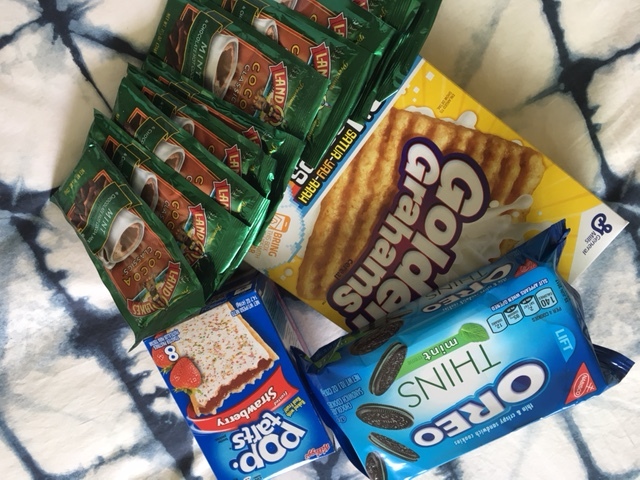 When anyone travels to the US, my daughter in the UK asks for graham crackers. She loves them and there is no real equivalent in the UK. We drank the last of our Kona coffee this morning. 😦 SO good. I think once we divide everything up we can make it fit. It will be tight though. 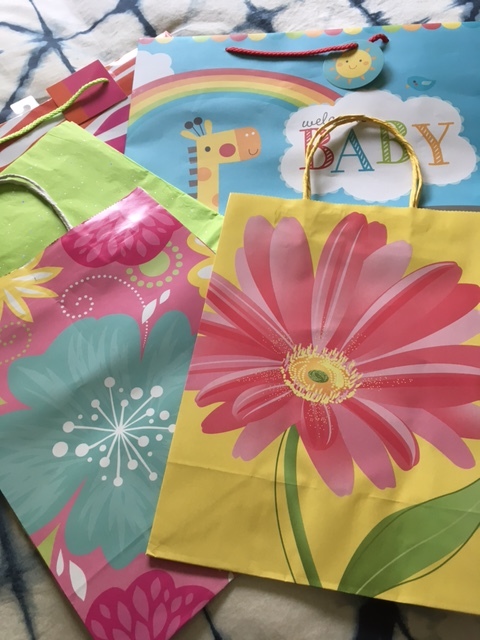 When we went to meet our grandson in 2011 we had to use space bags to get everything in, but we took along a lot more baby clothing than we are this time. Lots of American food is available now in Japan, but it is SO EXPENSIVE. I bought our son a box of Honey Nut Cheerios when I was there in 2014 – it cost $11!!! Golden Grahams, Pop Tarts, mint Oreos, and the hot chocolate are not available at all. He loves Diet Coke, but it’s not sold in Japan (they have Coke Zero, which our son says is not the same). The mini mart in the New Sanno sells Diet Coke by the case so we’ll buy it there for him and leave him with a good supply. Believe it or not, I’m not a big fan of Kona coffee. Brett and I like African or Indonesian coffees, dark roasted. Kona is way too expensive for our budget as well. But, it makes a nice gift! Well thought out gifts. Love the hippo and sun dress. I’m sure they will too.. Good luck with the packing. Our son loves hippos and collects them, so hippo gifts are always appreciated! I always say that Brett could get a baby grand piano into a carry-on bag, so his skills will be tested this time. You can do it! I have faith 🙂 . Have a great trip! I packed my tote bag today and was able to get far more than I thought into it . . . and it’s not that big a bag. So, I’m feeling hopeful – we still have our three bags, and Brett and YaYu’s backpacks left. Lovely selections. If you get a chance, I would be interested to hear more about the gifting culture in Japan – when are gifts expected? How do you know what type of item to buy and how much to spend? What kinds of gifts would be inappropriate? I have heard that used items are never exchanged? Big question! I think you could make a whole college-level course about giving and receiving gifts in Japan, it is such an integral part of the culture. Japan has a cultural emphasis on both obligation (giri) and benevolence (on), which trickles down into giving and receiving. That is, if someone is doing something for you, you have an obligation to repay their benevolence (way too simple an explanation, but like I said, it could be a whole semester’s course). So, you give gifts. However, your gift needs to be chosen carefully because it in turn places an obligation on the receiver. It can be very confusing. It’s also encoded into the language, whether you’re giving or receiving from someone higher or lower than you in the social hierarchy. Basically, if you visit someone’s home, you take a gift. You give gifts to your boss at the New Year. You give a gift of money at weddings (to help cover the cost because you will receive a gift from the bride and groom for attending their wedding. True story – when we lived in Japan a friend did not know this, and took a Western-style gift to the wedding. The gift she received from the bride and groom, given as thanks for helping them celebrate their marriage, was nicer than the gift she gave them! My friend was mortified). Anyway, you have to be careful not to give too much or to big a gift because it confers a bigger obligation on the receiver. Used gifts are NOT appreciated. EVER. A gift should be wrapped. Don’t open a gift you are given – set it aside and open it later. Say something to humble the gift you are giving. We kind of do a hybrid of this combined with American customs – it’s expected. So, our daughter-in-laws parents will look into the gift bag we give them and comment and say thank you, but not take out the gifts and share, like we would here. Our daughter-in-law will open her gifts right away, and will share food we bring. OK, more than you wanted to know, but the key is to not overdo it (i.e.a gift so big they could never pay you back), but don’t forget to bring a gift either. Gifts from where you live or have visited are appreciated and appropriate (i.e. local foods, crafts, etc.). That’s why we try to give things from Hawai’i, or things that are difficult to impossible to find in Japan, and our son and D-I-L do the same when they visit us. I recently read that the younger generations in Japan are becoming more individualistic rather than group-oriented, and do not feel as bound by the traditional social rules about gift giving, etc. They don’t feel the same depth of obligation that previous generations did. So like many here in North America, some there are probably more scrupulous about gift-giving than others.